kissing the frog: Is It Monday Again? I have often said I am a Monday person. Cheated on my healthy eating plan? I’ll start over again on Monday. Fell off the exercise wagon? I’ll go back to the gym on Monday. My house is a mess and I’ve been crabby with my sons? I’ll clean up and do better on Monday. Didn’t write anything all week? I’ll post something on Monday. For me, life has been an endless series of Mondays. Until Tuesday comes, that is. Tuesday is when . 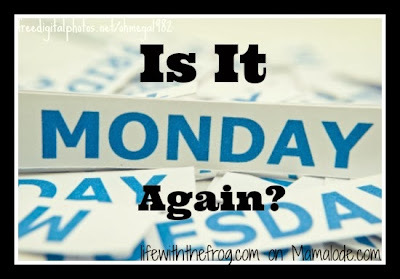 . . .
. . . Head on over to Mamalode to continue reading "An Endless Series of Mondays."